Chelsea and Westminster Hospital NHS Foundation Trust has carried out its first robotic-assisted total knee replacement operation—an innovative new surgical technique that will get patients back on their feet sooner than ever before. Initially part of a three month trial the results of the new procedure will be monitored to see how they compare to existing techniques. 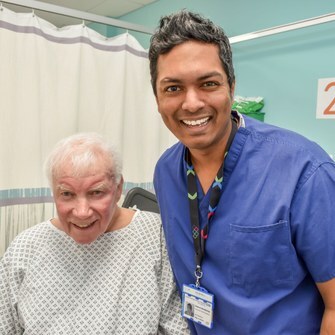 Dr Arjuna Imbuldeniya, Consultant Surgeon in Trauma and Orthopaedics, performed the successful operation on Wednesday 21 February on Mr David Patterson, aged 77, of Isleworth at West Middlesex University Hospital (pictured here shortly before the operation). It’s one of the first times that this innovative technology has been available in the NHS, with only two other NHS Hospitals in the UK also performing this type of surgery currently. Traditional surgery requires large cuts to be made around a patient’s knee to allow the use of the equipment required to perform the work. Using a mini semi-active robotic burr, surgeons are able to carry out more accurate and effective knee replacements with minimal invasion. This can help speed up recovery time, reduces post-operative pain and increases the longevity of the implants. Arjuna said: “Total knee replacement surgery globally has an 80% satisfaction rate amongst patients. There is a growing consensus that utilising computer and robotic technology to help perform bespoke and precise placement of the implants to 0.1 of a millimetre or degree, might help us achieve excellent results in more of our patients. Both knee and hip replacements have the ability to transform the lives of people, which is one of the reasons I love doing them. Over the past 15 years since I started out in my surgical career I’ve seen many innovations and improvements. Computer and robotic assisted surgery is very exciting, both for me using it and for the patients who will benefit from the latest technology..
David worked as a postman in Chiswick from 1960 to his retirement in 2005, having moved down from his hometown of Glasgow. The Trust prides itself on delivering world-class, high quality care for patients with a focus on continuous improvement and innovation. Just this month, Arjuna was awarded a Certificate of Excellence 2018 from independent patient feedback website, ‘iWantGreatCare’, based on his work at Chelsea and Westminster Hospital NHS Foundation Trust. These certificates are awarded annually to clinicians across the country who consistently receive positive feedback from those they’ve cared for.